As I noted on Twitter, a quick nod of the head to Ed Bott for his post on the Windows 7 upgrade chart published in Walt Mossberg's blog this week. I like his suggestion on upgrading from Windows Vista Home Basic or Home Premium (which I have) to Windows 7 Professional (which I plan to do). 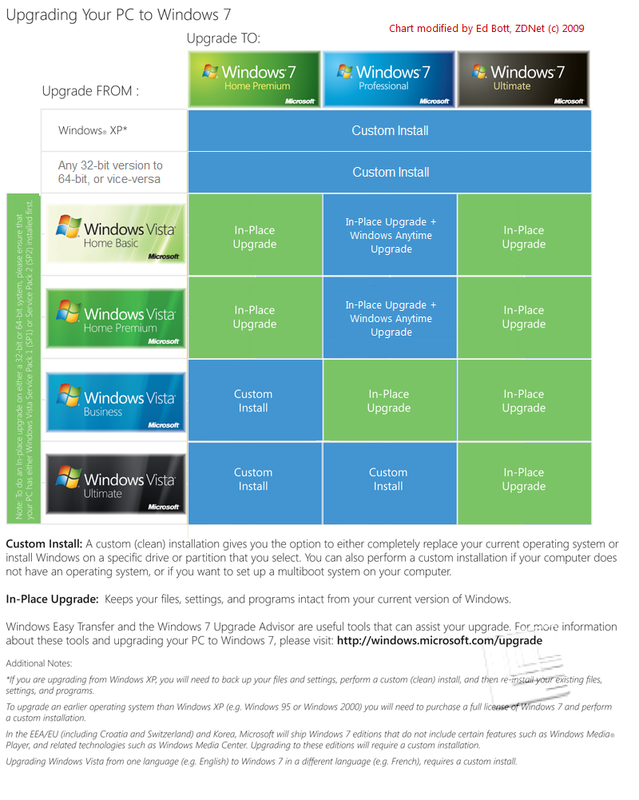 "Do an in-place upgrade from your Vista Home edition to Windows 7 Home Premium, then use Windows Anytime Upgrade to move up to Professional edition. Based on published prices, the extra cost is a mere $10. The Professional upgrade is $200; the Home Premium upgrade followed by a Professional upgrade is $120+$90, or $210. Using this strategy, you can keep all your installed programs and not have to worry about reinstalling and transferring data." Personally, I plan on doing a clean install (which I plan on detailing next week) to Windows 7 Professional on a couple of machines to for Media Center and to run Windows XP apps in Windows XP Mode, and Windows 7 Ultimate for my main machine and laptops to protect data on our PCs with BitLocker.